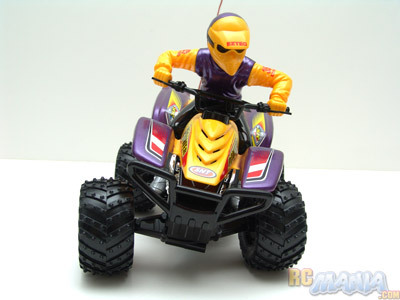 This is a pretty cool-looking ATV, pretty scale in size & dimensions with a partly-posable rider (the arms can be moved and the head can turn). The knobby tires are a good size and are nice & thick. Up front it has a bumper that seems pretty tough without being oversized and silly-looking. The suspension feels pretty soft, so I'd expect it to be able to handle some rough terrain. The most interesting thing is that it looks like it will actually lean in turns! That's a pretty nice touch. The ATV itself takes 5 AA's, but the removable battery compartment can be kind of a pain. There's a release lever on the side under one fender, but the pack still got stuck pretty easily and I had to fuss with it to get it to come out. 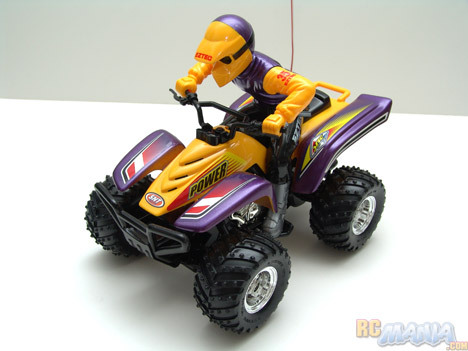 For an RC that only uses 5 AA batteries this ATV is actually decently fast, and as expected, it can go over carpet and various bumps and short obstacles pretty well without getting stuck too often. It does lean in turns on its own, but there's a big problem with the turning itself -- it doesn't do much of it. It turns so little at any speed, it's almost impossible to make it just turn around without going back & forth a lot of times, unless you have a really, really large open lot to drive in. Too bad! This little ATV sure looks nice, it was pretty cheap, and it's pretty rough & tumble, but the fun immediately stops as soon as you try to turn! I worry that even younger kits would get frustrated with it pretty easily unless they like the look so much that they're willing to just chase it around and make it turn by picking it up and physically changing its direction!